This example shows how to detect correlation among predictors and accommodate problems of large estimator variance. It is the second in a series of examples on time series regression, following the presentation in the previous example. 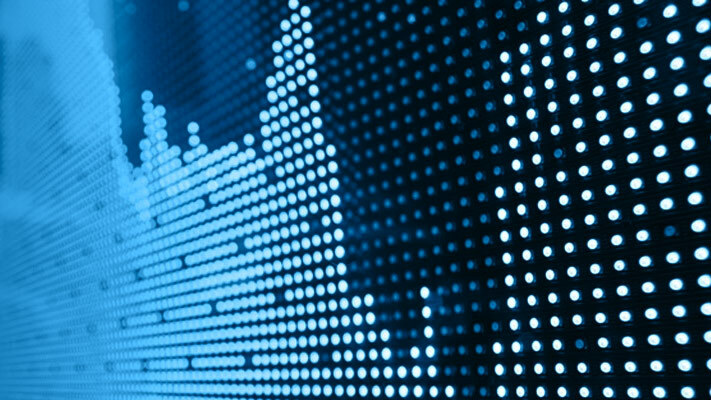 Economic models are always underspecified with respect to the true data-generating process (DGP). Model predictors never fully represent the totality of causal factors producing an economic response. Omitted variables, however, continue to exert their influence through the innovations process, forcing model coefficients to account for variations in the response that they do not truly explain. Coefficient estimates that are too large (type I errors) or too small (type II errors) distort the marginal contribution of each predictor. In some cases, coefficients even end up with the wrong sign. Economic models can also be overspecified, by including a theory-blind mix of predictors with the hope of capturing some significant part of the DGP. Often, "general-to-specific" (GETS) estimation methods are applied with a misplaced trust that standard diagnostic statistics will sort out the good predictors. However, the very presence of causally insignificant predictors tends to increase estimator variance, raising the possibility that standard inferences will be unreliable. The reality of working with misspecified models is addressed in this, and subsequent, examples in this series. Underspecified models often introduce correlation between predictors and omitted variables in the innovations process. Overspecified models often introduce correlation among predictors. Each presents its own problems for model estimation. In this example, we look specifically at problems arising from correlated predictors. The somewhat more complicated issues related to correlation between predictors and innovations (exogeneity violations) are addressed in the example on "Lagged Variables and Estimator Bias." Correlation coefficients highlighted in red have a significant t-statistic. 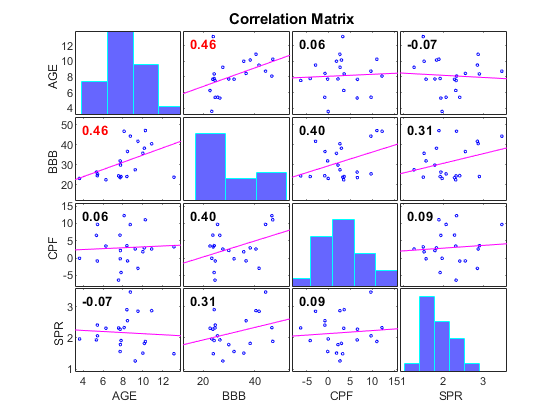 The predictor BBB again distinguishes itself by its relatively high correlations with the other predictors, though the strength of the relationships is moderate. Here the visualization is particularly helpful, as BBB displays fairly disorganized scatters, with the possibility of a number of small, potentially influential data subsets. The plots are a reminder of the limitations of the linear correlation coefficient as a summary statistic. As shown in the previous example on "Linear Models," coefficient estimates for this data are on the order of 10-2, so a κ on the order of 102 leads to absolute estimation errors ‖δβ‖ that are approximated by the relative errors in the data. Correlations and condition numbers are widely used to flag potential data problems, but their diagnostic value is limited. Correlations consider only pairwise dependencies between predictors, while condition numbers consider only Xt in aggregate. Relationships among arbitrary predictor subsets (multicollinearities) can fall somewhere in between. CLM assumptions forbid exact relationships, but identifying the strength and source of any near relationships, and their specific effect on coefficient estimation, is an essential part of specification analysis. The qualitative nature of these criteria is apparent, and unfortunately none of them is necessary or sufficient for detecting collinearity. The signs of the coefficient estimates are consistent with theoretical expectations: AGE, BBB, and SPR add risk; CPF reduces it. The t-statistics, which scale the coefficient estimates by their standard errors (computed under the assumption of normal innovations), show that all predictors are significantly different from 0 at the 20% level. CPF appears especially significant here. The significance of a predictor, however, is relative to the other predictors in the model. where σ2 is the variance of the innovations process (assumed constant), SSTi is the total sample variation of predictor i, and Ri2 is the coefficient of determination from a regression of predictor i on the remaining predictors (and intercept, if present). is called the variance inflation factor (VIF), and is another common collinearity diagnostic. When the variation of predictor i is largely explained by a linear combination of the other predictors, Ri2 is close to 1, and the VIF for that predictor is correspondingly large. The inflation is measured relative to an Ri2 of 0 (no collinearity), and a VIF of 1. How large a VIF is cause for concern? As with significance levels for standard hypothesis tests, experience with certain types of data may suggest useful tolerances. Common ad hoc values, in the range of 5 to 10, are of little use in general. 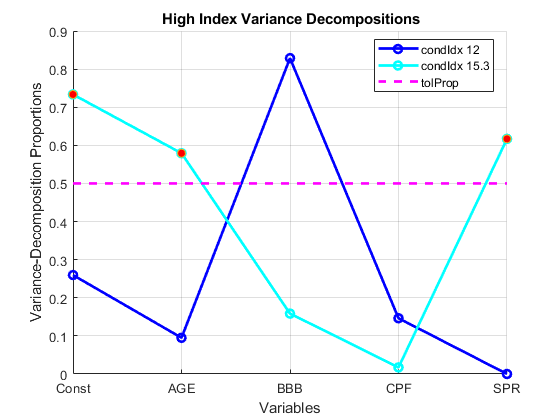 In this case, BBB has the highest VIF, but it does not jump out from the rest of the predictors. More importantly, VIF is only one factor in the variance decomposition given above. A large VIF can be balanced by either a small innovations variance σ2 (good model fit) or a large sample variation SSTi (sufficient data). As such, Goldberger  ironically compares the "problem" of multicollinearity, viewed in isolation, to the problem of data "micronumerosity." Evaluating the combined effect of the different sources of estimator variance requires a wider view. Econometricians have developed a number of rules of thumb for deciding when to worry about collinearity. Perhaps the most common says that it is acceptable to ignore evidence of collinearity if the resulting t-statistics are all greater than 2 in absolute value. This ensures that 0 is outside of the approximate 95% confidence interval of each estimate (assuming normal innovations or a large sample). Because t-statistics are already adjusted for estimator variance, the presumption is that they adequately account for collinearity in the context of other, balancing effects. The regression results above show that three of the potential predictors in X0 fail this test. These rules attempt to identify the consequences of collinearity, as expressed in the regression results. As we have seen, they can offer conflicting advice on when, and how much, to worry about the integrity of the coefficient estimates. They do not provide any accounting of the nature of the multiple dependencies within the data, nor do they provide any reliable measure of the extent to which these dependencies degrade the regression. Belsley reformulates the eigensystem of XtTXt in terms of the singular values of the matrix Xt, which can then be analyzed directly, with greater numerical accuracy. If the singular values of Xt are μ1,...,μn, where n is the number of predictors, then the condition number of Xt is κ=μmax/μmin. Belsley defines a spectrum of condition indices ηj=μmax/μj for each j=1,...,n, and shows that high indices indicate separate near dependencies in the data. The πji give the proportion of Var(βiˆ) associated with singular value μj. • The number of high condition indices identifies the number of near dependencies. • The size of the condition indices identifies the tightness of each dependency. • The location of high proportions in a high index row identifies the dependent predictors. • The size of the proportions identifies the degree of degradation to regression estimates. Again, a tolerance for "high" must be determined. Belsley's simulation experiments suggest that condition indices in the range of 5 to 10 reflect weak dependencies, and those in the range 30 to 100 reflect moderate to high dependencies. He suggests a tolerance of 0.5 for variance decomposition proportions identifying individual predictors. Simulation experiments, however, are necessarily based on specific models of mutual dependence, so tolerances need to be reevaluated in each empirical setting. The plot shows critical rows in the variance decomposition table, above the index tolerance. The row associated with condition index 12 has only one predictor, BBB, with a proportion above the tolerance, not the two or more predictors required for a dependency. The row associated with condition index 15.3 shows the weak dependence involving AGE, SPR, and the intercept. This relationship was not apparent in the initial plot of the correlation matrix. In summary, the results of the various collinearity diagnostics are consistent with data in which no degrading near relationships exist. Indeed, a review of the economic meaning of the potential predictors (easily lost in a purely statistical analysis) does not suggest any theoretical reason for strong relationships. Regardless of weak dependencies, OLS estimates remain BLUE, and the standard errors in the regression results show an accuracy that is probably acceptable for most modeling purposes. 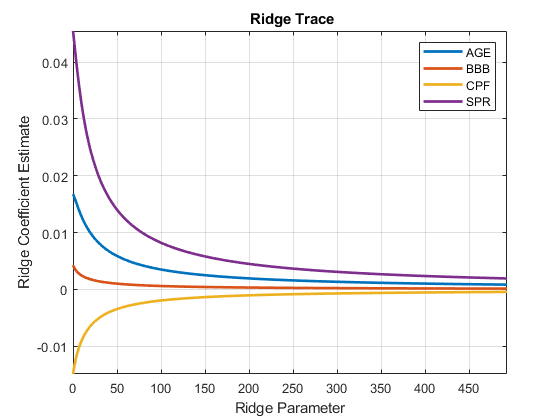 To conclude, we briefly examine the technique of ridge regression, which is often suggested as a remedy for estimator variance in MLR models of data with some degree of collinearity. The technique can also be used as a collinearity diagnostic. where k is a positive ridge parameter and I is the identity matrix. The perturbation to the diagonal of XtTXt is intended to improve the conditioning of the eigenvalue problem and reduce the variance of the coefficient estimates. As k increases, ridge estimates become biased toward zero, but a reduced variance can result in a smaller mean-squared error (MSE) relative to comparable OLS estimates, especially in the presence of collinearity. The plot shows exactly the opposite of what one would hope for when applying ridge regression. 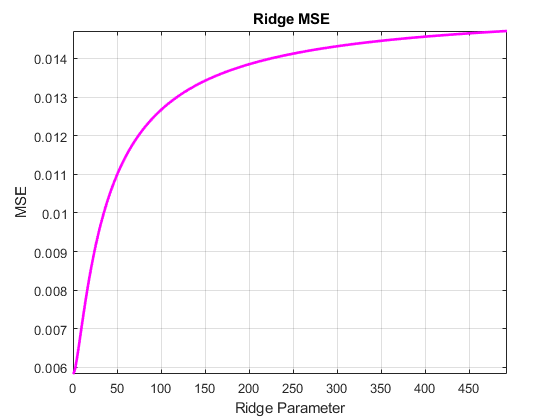 The MSE actually increases over the entire range of ridge parameters, suggesting again that there is no significant collinearity in the data for ridge regression to correct. A technique related to ridge regression, the lasso, is described in the example on "Predictor Selection." This example has focused on properties of predictor data that can lead to high OLS estimator variance, and so unreliable coefficient estimates. The techniques of Belsley are useful for identifying specific data relationships that contribute to the problem, and for evaluating the degree of the effects on estimation. One method for accommodating estimator variance is ridge regression. Methods for selectively removing problematic predictors are addressed in the examples on "Influential Observations" and "Predictor Selection." Belsley, D. A., E. Kuh, and R. E. Welsch. Regression Diagnostics. Hoboken, NJ: John Wiley & Sons, 1980. Goldberger, A. T. A Course in Econometrics. Cambridge, MA: Harvard University Press, 1991. Hoerl, A. E., and R. W. Kennard. "Ridge Regression: Applications to Nonorthogonal Problems." Technometrics. Vol. 12, No. 1, 1970, pp. 69-82. Moler, C. Numerical Computing with MATLAB. Philadelphia, PA: Society for Industrial and Applied Mathematics, 2004. Stone, R. "The Analysis of Market Demand." Journal of the Royal Statistical Society. Vol. 108, 1945, pp. 1-98. Wooldridge, J. M. Introductory Econometrics. Cincinnati, OH: South-Western, 2009.